To prepare a scenario, the team leader uses the Flight Planning Tool. This tool is used to fill all mission relevant data into a form, useful during the mission run. But it is not only a form. All data like flight times, speeds and load out are measured out and recalculated. After completion, the resulting form is delivered to all members as base for the following online flight briefing. A typical scenario would start with a meeting on a TeamSpeak server. The radar server would have been started first, because it is needed for the briefing tool. 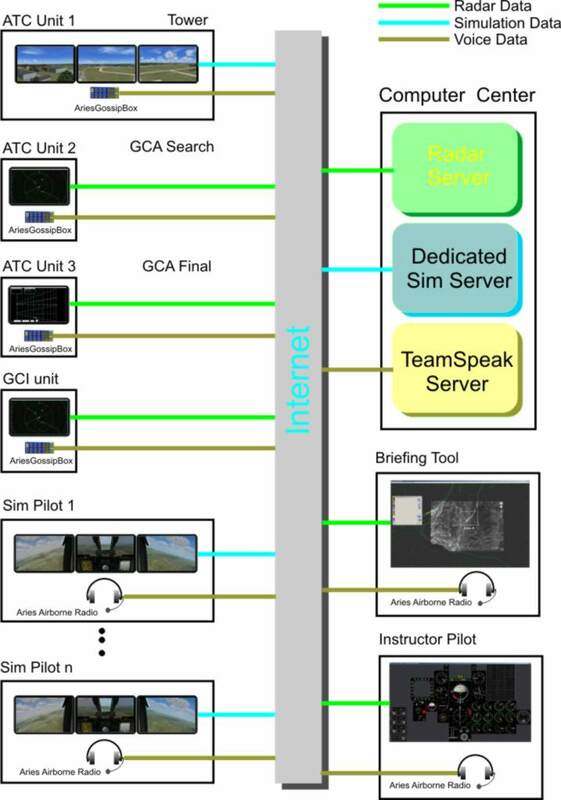 The team leader would start a detailed briefing and delivers all the different roles and briefing tool forms to sim pilots and controller. Explanations on the map, as well as interactive drawings can be seen by the briefing clients on the local briefing tool screen. Once the briefing is done, the radar applications may be started. They establish contact to the radar server. The radar screens do not show any action for the moment because the simulation was not started. Now the DCS World game server will be started. In parallel, all sim pilots start their DCS World. As soon as the simulation runs, the airborne radios go in contact with the local TeamSpeak client. From this moment on, all participants may talk to each other if they are on the same radio frequency. The aircraft and ground vehicles will become visible on the radar screens if they are in the physical range of the specific radar.